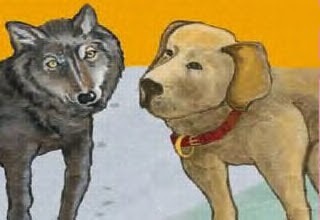 Story To Learn - The Wolf and the Dog. Reading stories is a very enjoyable activity, especially if the story is interesting. In addition, a lot of reading stories can also improve our reading skills especially the ability to read in English. For this reason, this time I will share an interesting story that we can use as a means of entertainment as well as English language training. The story that I will share this time entitled "The Wolf and the Dog", Check out the story below. Then why not join us? Asked the dog. "I work regularly and I eat regularly. You could do the same. I will arrange it. You can help me and the other dogs guard the sheep. In that way, we won't have to worry about your stealing the sheep any more and you won't have to worry about going hungry any more. It's a good deal for both of us." The wolf thought it over for a few minutes and then decided that the dog was right. So they went off together toward the ranch house where the dog lived. But, as they were walking, the wolf noticed that the hair on a certain part of the dog's neck was very thin. He was curious about this, for the dog had such a beautiful coat every where else. Finally, he asked the dog about it. That's right," answered the dog. "But, You'll get used to it soon enough. I hardly think about it anymore." "But, if I am chained up, then I won't be able to walk when I want to take a walk or to run where I want to run," the wolf said. "If I come to live with you, I won't be free anymore." After saying this, the wolf turned and ran away. After reading and understanding the above short story, it's time for you to examine more deeply about the message of the story. Thus you will be able to identify the story just read it. To begin with you can assess from the intrinsic and extrinsic contained in the story. What is a moral message of the story? How character and characterization in the story above? What about the style of language used? What about the theme of the story?